February 8, 2018 at 12:10a.m. A fast moving winter storm dumped several inches of snow on The Valley today. Heavy early-morning snowfall complicated travel for many Mahoning Valley motorists Wednesday and posed a challenge for snowplow drivers. With the snow hitting about 4 a.m., many roads across Mahoning and Trumbull counties, whether maintained by local communities, counties, or the state, were snowy and slushy as motorists made their morning commutes. And the snow isn’t done. The National Weather Service is forecasting a 50 percent chance of snow then rain or snow Friday afternoon. The high for today is 23 degrees, with a 20 percent chance of snow. Youngstown schools will remain closed today, in anticipation of poor travel conditions. An Ohio Department of Transportation spokesman said the heavy and continuous snowfall throughout Wednesday morning made it challenging to keep roads cleared. “The issue really is that the snow is coming down at about an inch an hour,” said Brent Kovacs. He said ODOT did everything it could to clear the roads, and reminded motorists to slow down, give themselves extra time to reach their destinations, and leave plenty of room for plow drivers. Loree said a few inches of snow between 7:30 and 10 a.m. made it difficult for plow drivers to catch up. By late Wednesday afternoon, though, he reported most streets appeared to be clear. Mahoning County Engineer Pat Ginnetti said he started crews at 4 a.m. Wednesday, which helped the county stay on top of things. “It was a little tough at first because it was coming down pretty heavy,” Ginnetti said. By late afternoon, he said most county roads appeared to be in good shape. Ginnetti advised drivers to give themselves extra time on their commutes, leave extra space between cars and to use their headlights when visibility is poor. In Girard, cars were crawling down the main streets at 20 to 30 mph about 9 a.m. The main roads appeared to have a thin layer of snow but were manageable to drive on. 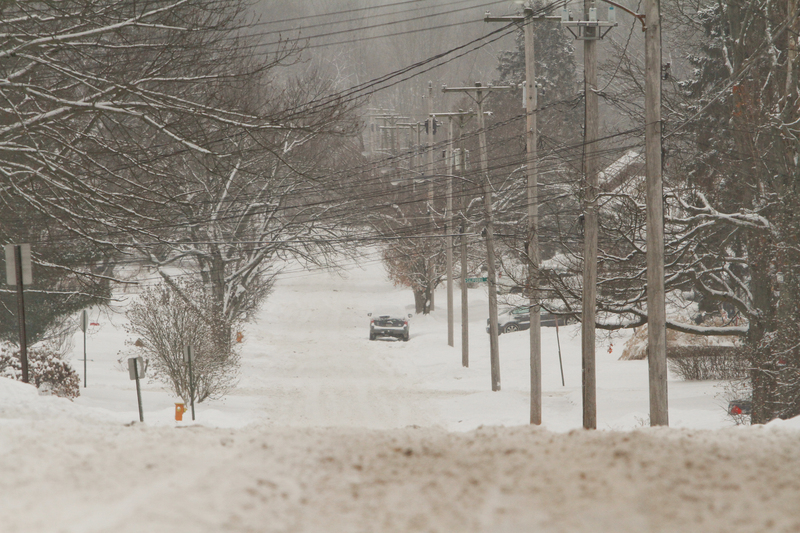 Some of the side roads, such as Davis Street, appeared to be untouched by plows at that time. In Liberty, cars were taking it slow down Belmont Avenue. Around 10 a.m., it was evident the snowplows had combed the street, but the road was still covered in a thin layer of snow. Cars spun their wheels attempting to exit parking lots and enter Belmont Avenue, trying to get over the snow piles that were built up on the side of the road by the plows pushing snow. About 3:30 p.m. Wednesday, Canfield Township was making its third run on plowing. Drivers were out plowing about 4:30 a.m., trying to keep up with the about an inch-an-hour snowfall. Throughout the day, Rogers said he received reports of drivers sliding off the road. Drivers for Austintown Township had about a 12-hour day of plowing. Dockry said drivers were out by 6 a.m. Wednesday, and likely wouldn’t finish plowing until 6 or 7 p.m. The township’s 10 large plow trucks will run at all times, hitting the main roads, and small trucks will take care of the suburbs. The Mahoning County Sheriff’s Office briefly closed a section of U.S. Route 224 in Canfield due to motorists having a difficult time getting up the hill between Tippecanoe Road and Seville Drive. The weather conditions led to numerous closings and delays. Youngstown city schools were canceled. Youngstown State University closed until noon, and canceled various evening events. The National Weather Service in Cleveland removed a winter weather advisory Wednesday afternoon, and reported that most of the snowfall was done for the time being. December 14, 2017 12:10 a.m.
February 17, 2016 12:01 a.m.
December 15, 2017 12:09 a.m.
February 7, 2018 12:36 p.m.
January 10, 2009 12:10 a.m.